Hundreds of Wake Forest University students from a range of political perspectives came together to hear Chelsea Clinton speak at a Women in Leadership roundtable on Sept. 13. Her visit to Wake Forest was a campaign stop for her mother Hillary Clinton’s presidential bid. Chelsea Clinton, the daughter of the Democratic presidential nominee and former President Bill Clinton, appeared on a panel that focused on a variety of topics of particular interest to women, including early childhood education, college affordability, and equal opportunities and wages for all. “College affordability is a women’s issue. Higher education affordability is a women’s issue in the same way that economics is a women’s issue and the same way that childcare shouldn’t just be a women’s issue, but a family issue and an economic issue. All of these are connected,” she said. Other panelists included Paige Meltzer, Director of the Women’s Center at Wake Forest; Chizoba Ukairo, a Wake Forest senior and student leader; Denise (DD) Adams, Winston-Salem Council Member; and Lisbeth C. (Libba) Evans (‘74, MBA ‘78), iActive Learning founding partner and University Trustee. Her own early role model was the late Supreme Court Justice Thurgood Marshall, but she couldn’t see herself in him. She said she felt a void that has only been filled as she’s gotten older and women like U.S. Attorney General Loretta Lynch and Supreme Court Justice Sonia Sotomayor have come along to show that women can rise to the highest legal offices in the country. “Examples like that show why women in leadership is not just important but imperative and crucial for young women in this country,” Ukairo said. A senior psychology major, Ukairo is the epitome of a female student leader on campus. 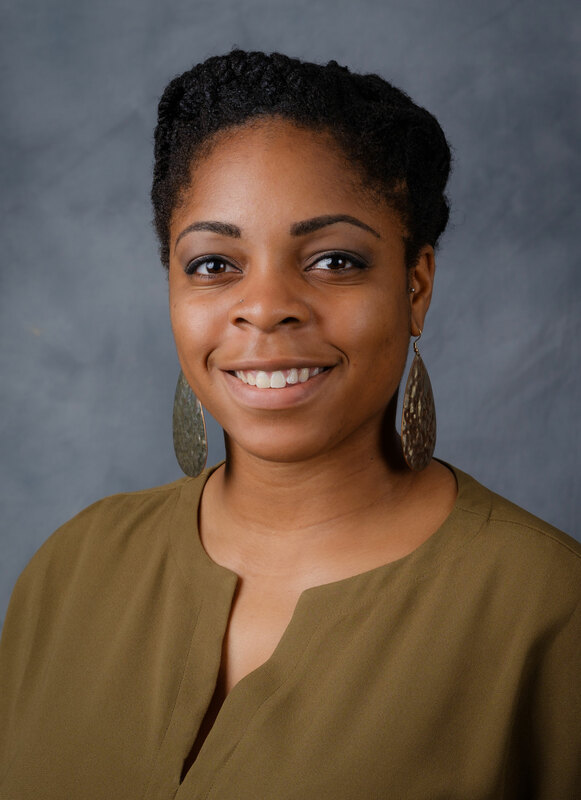 The student recipient of Wake Forest’s 2016 Martin Luther King “Building the Dream” award winner, Ukairo is founding director of Branches social justice retreat and a President’s Aide. Her research as an Anna Julia Cooper Center research fellow has enabled her to partner with the Institute of Women and Ethnic Studies, a New Orleans nonprofit organization, to explore how African American women navigate stereotypes and the impact on their physical/mental health and self-care practices. Ukairo is one of more than two-dozen students participating in Wake the Vote, an ongoing immersive experience that takes the classroom to the campaign trail, many of whom had the opportunity to meet with Chelsea Clinton while on campus – whether they plan to vote for Hillary Clinton or not. 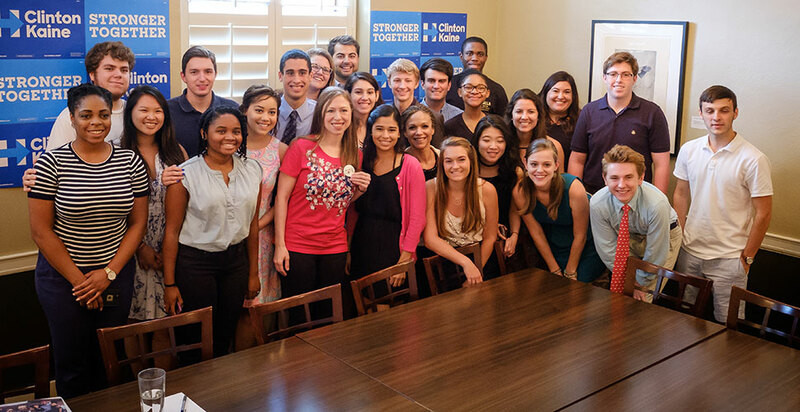 Many of the Wake the Vote students gathered for an informal conversation with Clinton following the panel discussion. The students talked with her about bipartisan cooperation and the need for engagement in politics at all levels, not just during a presidential election year. Clinton also shared a bit about her experience growing up in the White House. 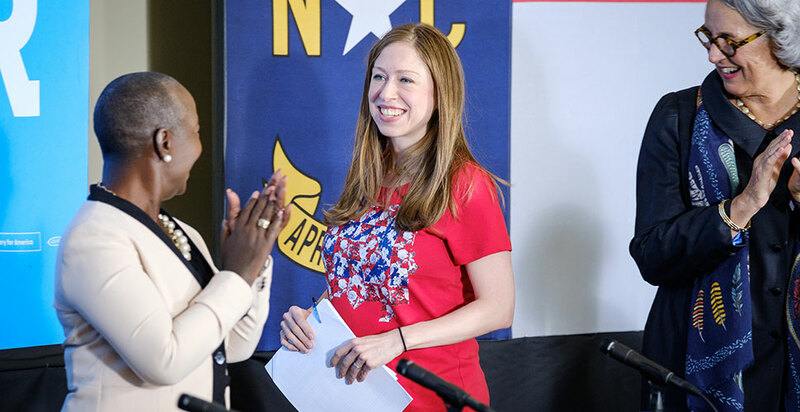 After the event, Chelsea Clinton complimented the Wake the Vote students and thanked the Wake Forest community for her visit. Students participating in Wake the Vote — a yearlong program that combines classroom and real-world political experience — have attended campaign events for a number of Democratic and Republican presidential candidates, including Donald Trump, Marco Rubio, Ted Cruz, Donald Trump, Bernie Sanders, Hillary Clinton, Jeb Bush, John Kasich and Chris Christie. They also attended the Democratic and Republican national conventions and have been involved with voter registration efforts. 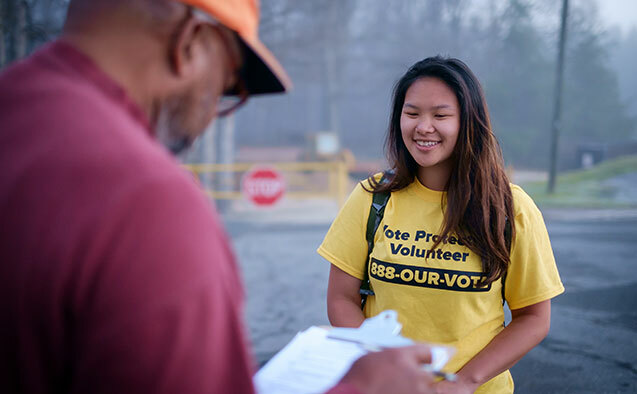 This fall the students will be focused on programming for the Wake Forest University and Winston-Salem/ Forsyth Community in advance of the election on topics such as education, immigration, gun violence, and voting/youth participation. Engage with #WakeTheVote on social media. The Reynolda Campus has a long history of hosting U.S. Presidents and presidential candidates, starting with President Harry S. Truman’s participation in Wake Forest’s groundbreaking ceremony in 1951. 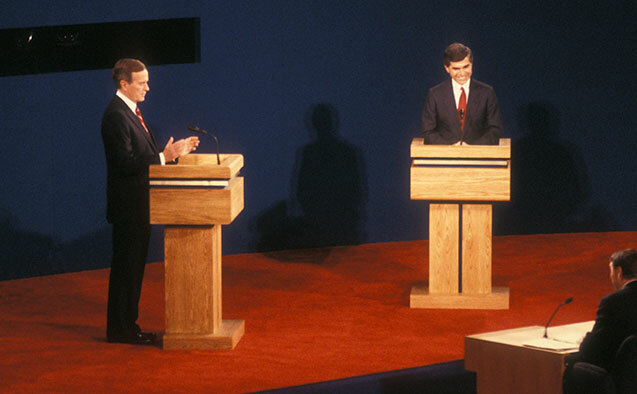 Notably, Wait Chapel has been home to two presidential debates in 1988 and 2000. Statement from Wake Forest University: As an educational institution, Wake Forest is committed to promoting the free exchange of ideas, which includes providing a forum for speakers who express a wide variety of political views. The university’s tax-exempt status, however, requires that it not engage in any political campaign activity, which means the university is prohibited from endorsing or opposing any candidate for political office. Wake Forest takes its obligation in this regard very seriously. This event does not represent an endorsement by Wake Forest of any candidate for public office.